Note: As far as I am aware, this is an audio reading of Courtney's previously-published memoir Five Rounds Rapid! (not the subsequently-published Still Getting Away with It). He's seen off Daleks, Cybermen and Yeti. He's witnessed Giant Robots running amok, met himself in the future and saved the world from the life-devouring Destroyer. 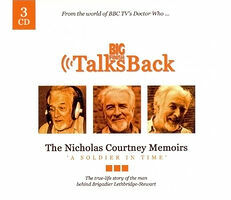 He is, of course, Brigadier Alistair Gordon Lethbridge-Stewart, alias actor Nicholas Courtney.